WELLSTYLES healthy living every day! from the American Heart Association and American Stroke Association warns of surprisingly high sodium levels in the “salty six” common foods, including bread, cold cuts, pizza, and chicken. Researchers say the average American takes in about 3,400 milligrams (mg) of sodium a day, more than twice the AHA’s recommended limit of 1,500 mg. But little of that excess salt comes from the salt shaker. Experts say more than 75% of people’s salt comes from eating processed or restaurant foods. “Excess sodium in our diets has less to do with what we’re adding to our food and more to do with what’s already in the food,” says Linda Van Horn, PhD, RD, a research nutritionist at Northwestern University and an American Heart Association spokeswoman. puffiness, swelling, and bags under the eyes. In conjunction with today’s National Healthy Eating Day, the AHA is highlighting the dangers of high sodium levels in common foods. 1. Bread and rolls. One piece of bread can have as much as 230 mg of sodium. That’s 15% of the recommended daily amount. Although each serving may not sound like much, it can quickly add up throughout the day, with toast at breakfast, a sandwich at lunch, and a roll at dinner, etc. 2. Cold cuts and cured meats. Deli or pre-packaged turkey can have as much as 1,050 mg of sodium. It’s added to most cooked and processed meats to reduce spoilage. 3. Pizza. One slice can have up to 760 mg of sodium. That means two slices accounts for a day’s worth of salt. 4. Poultry. Packaged raw chicken often contains an added salt solution. Depending on how it’s prepared the sodium level can quickly add up. Just 3 ounces of frozen and breaded chicken nuggets contains about 600 mg of sodium. 5. Soup. This cold-weather staple can contain a day’s worth of sodium in a single bowl. One cup of canned chicken soup can have up to 940 mg of sodium. 6. Sandwiches. Breads and cured meats are already high in salt, and putting them together with salty condiments like ketchup and mustard can add up to more than 1,500 mg of sodium in a single sandwich. level of 1,500 mg for African-Americans, people who are older than age 51, and people who have high blood pressure. 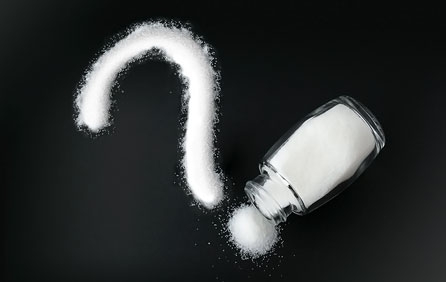 The association defended its call for all Americans to drastically cut back on sodium to 1,500 mg, saying recent studies linking lower sodium diets to poor health have serious flaws. Morton Satin, vice president for science and research at the Salt Institute, an industry group, disagrees with that view. He says the AHA review represents “spinning of evidence by committed advocates. The authors … have banded together for the express purpose of maligning any and all evidence that does not support the conventional salt reduction agenda,” Satin says. foods is a good idea,” Nestle says. Keep the “salty six” in mind when grocery shopping or ordering from a menu. Try having half a sandwich with a side salad rather than a whole sandwich, or limiting the cheese and adding extra veggies to pizza. 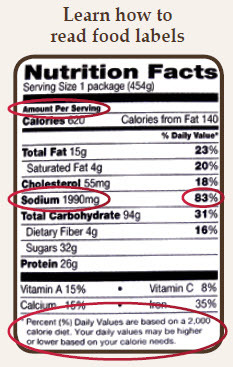 Look for sodium levels in the nutrition facts label when grocery shopping, and calorie labeling information in restaurants. Keep in mind that packaged foods like canned soup often contain more than one serving. Nutrition information like sodium content is based on one serving, so adjust accordingly. Look for heart-healthy foods approved by the AHA labeled with a red heart and white check mark. Excellent information, with salt being hidden, is it any wonder the US has an epidemic of High blood pressure? Its wonderful as your other articles : D, thanks for posting . “Experience is that marvelous thing that enables you to recognize a mistake when you make it again.” by Franklin P. Jones.